Start small, build up. Small, reachable goals -- when (if) it works, up the goal. Be specific. Ask people to do something specific (not "support us"). Start with a match. Double-your-gift matches work magic everywhere, including Facebook. Spread the word. Invite people to take part. Show appreciation. You will not have contact information for donors who give through Facebook. Message them and thank them! It's pretty much the same as all other fundraising: Talk to the right people, give them something to do that they believe in, make it easy, and treat them well. One of the most sound pieces of advice you can get for writing strong fundraising is this: Always write to you grandmother. Or your mother, aunt, godmother, friendly older neighbor -- but make it a specific person you know and can easily picture and imagine realistic conversations with. Don't sound like a used car salesman. Overblown sales language sounds fake. Especially to older people, who weren't born yesterday. Find an approach that allows you to be genuinely enthusiastic. It's almost impossible to fake enthusiasm. Find the real thing within. Align your own enthusiasm to what's important to her. It's probably not exactly the same. Figure out why she cares and go there with her. Place a premium on your long-term relationship. Make it clear that this isn't just a transaction. Use conversational language. Don't try to impress with your education or professionalism. Be warm and personal. Funny thing is, writing to Grandma isn't just more effective, it's more fun! Want help writing to Grandma and bringing it home to your donors? I'm available for free 25-minute coaching sessions. Just click here and directly schedule an online conversation with me or with Sean Triner. Tom Ahern and I had a 20-minute conversation the other day about the ways branding can help and hurt a nonprofit organization. We concluded that there's a syndrome out there that's hurting a lot of fundraising programs: Awesomeness Syndrome -- the compulsion to overwhelm people with how awesome an organization is ... to the point that you're no longer raising funds, but actually persuading people that they needn't give. 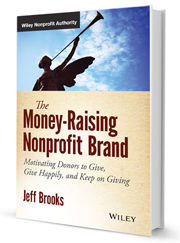 We also talked a bit about my book, which you might consider reading if you want to build a brand that supports and improves fundraising results: The Money-Raising Nonprofit Brand. Want help turning your brand into a fundraising plus? I'm available for free 25-minute coaching sessions. Just click here and directly schedule an online conversation with me or with Sean Triner. Here's a report of an excellent head-to-head test, reported at npENGAGE: Is Your Online Donation Form Turning Off Donors?. It was on an online donation form. The high-to-low test pulled 15.7% decrease in gifts and a 11.3% decrease in average gift, for a total 25.2% drop in revenue. The difference was statistically significant. I hesitate to say high-to-low ask arrays are an automatic no-no in online fundraising. But with results that definitive, I wouldn't do it except in a test to my own file. And it's not something I'd feel urgently needs to be confirmed or not. Ask arrays can make a big difference in fundraising. It seems like a minor detail, but it can have out-size impact on revenue. Online or offline. More than three asks (I've found that usually more asks are better). More random-looking amounts. (Instead of $25, ask for $26). Including at least one very high amount that's way out of sequence with the others. Trying low amounts (this sometimes has the surprising effect of lifting average gift). The amounts not in order, but scrambled. Don't take "the normal way of doing it" for granted. But don't just change it without knowing the impact of the change. It matters a lot more than it looks like it would. Let's talk. I can work with you on getting the details right in your fundraising, online or off. I'm available for free 25-minute coaching sessions. Just click here and directly schedule an online conversation with me or with Sean Triner. Let me introduce you to a very useful term: Wat/San. In the international relief and development sector, it means "water and sanitation programs." It's useful because water and sanitation programs are common and various. Having a short way of referring to them speeds up and smooths out a lot of communications. A few years ago, I visited projects in northern Uganda on behalf of a nonprofit. One day, I was told we were going to "visit Wat/San." "Who's Watson?" I asked, labelling myself as the newbie. At the project site, we were treated to a song and dance performance about the Wat/San project: Young men, wearing traditional tribal clothing, accompanied by drums and mbira, sang in the local language. I could make out the word "Wat/San" in their song. So I learned that in the heart of Africa, where it matters, the term "Wat/San" was well-known, even integrated into the language and culture. And back at headquarters, everyone but the new intern knows all about Wat/San. Not knowing the term is a sign of cluelessness. I like hidden knowledge. It pleases me to know this term. Probably not one in a thousand. And that's the problem. Saying "Wat/San" marks you as an insider. And it marks your donor as an outsider. Which is not a promising way to motivate the donor to give. One of the most important and effective ways you can empower your donors is to speak their language. Don't make them learn yours. It behooves you to be educated about your cause. To learn the insider terminology like Wat/San and sustainable and capacity building and at-risk youth. But when you're talking to donors, keep those terms in your pocket. Use non-specialist language. Want help with your fundraising writing? I'm available for free 25-minute coaching sessions. Just click here and directly schedule an online conversation with me or with Sean Triner. She is not one of your donors. You are one of her charities. That's all you really need to know about fundraising. Here's what really chokes off a lot of promising fundraising programs: The need to bring in net-positive cash right now. Starbucks spends $1,400 to acquire a customer who starts off by spending $4.25 for a Caramel Frappacino. If a nonprofit reported numbers like that, you can almost hear the bellowing board member with a calculator: That's a cost to raise of dollar of $329! What's wrong with you people? Things would go very poorly at the board meeting ... unless someone pointed out that the lifetime value of a Starbucks customer is $14,099. Which is what Starbucks is going on. As is every other smart business on the planet. Smart fundraisers think that way too. Acquiring new donors is almost always a money-losing activity. Get used to it. The math you need to be paying attention to is the lifetime value of the new donors you're getting. Your program is in good shape if that pencils out, the way it does for Starbucks. Now and then, very rarely, someone manages to make positive net revenue on a donor acquisition activity. It's great when it happens, but it's not normal. It's also not necessary for running a successful, sustainable fundraising program. In fact, if you insist on making net revenue from donor acquisition ... I can almost guarantee you are not running a sustainable fundraising program. You will eventually find yourself in a financial death-spiral, with too few donors coming in to replace those who leave, and less and less ability to turn things around as it accelerates. Growth requires investment. Investment requires spending money. No matter how much your board would like to live in a different kind of world, you can't pretend it's otherwise. Starbucks got where they are by thinking this way. If you want to grow (even if you just don't want to wither away), you should too. I can help you build a long-term fundraising plan that will fund your program well into the suture. And I'm available for free 25-minute coaching sessions. Just click here and directly schedule an online conversation with me or with Sean Triner. Awhile back, my daughter (a college student), sent a short thank-you note to my godmother (a lady in her 70s). She had considerably more to say about the note than the note itself said. When I get a note from somebody, I look at it, think to myself, Well, isn't that nice, and move on to other things. Not that big a deal. I imagine you're like me. Which got me thinking about the differences between older people (which I'll define as people over 70) and us (which I'll define as people comfortably under 70). They have more time on their hands than we do. They take time to savor small pleasures that we often rush past in our urgency to get everything done. They deeply value relational connections, even distant ones that we tend to hurry past. They really love getting stuff in the mail. For us, the mailbox is mainly a depressing wasteland of bills, bad-deal credit offers, and irrelevant catalogs. They still get real stuff from real people. Most of our donors are these older people. That's why direct-mail fundraising hasn't just faded away like some people have thought it would. Remember that you're cultivating a relationship, not making a business transaction. Most important: Always have a mental picture of a specific older woman in mind when you create fundraising materials. Want to really connect with your donors? Take Tom Ahern's online course, Making Money With Your Donor Newsletter. A full, four-part online course that will give you everything you need to produce a newsletter that's relevant, thrilling, and motivating for your donors. $100 off until May 24! Do you care about how many spaces are between sentences? You probably saw something about the study recently that says two spaces after a period is more readable than one. ... there was an increase in reading speed of 3% when reading text with two spaces following periods, as compared to one. This is ... an average of nine additional words per minute above their performance under the one-space conditions. Being an opinionated writer, I have opinions about the two-space vs one-space "controversy." 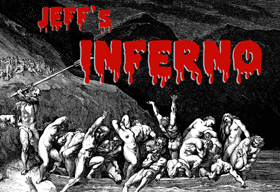 This is going to be awfully nerdy, so if you're not a nerdy word-person, you might want to move along about now. I have no way of knowing if the research was valid, repeatable, or meaningful. But I bet that if that extra space between sentences matters, it only matters a little bit. Do you really think that a block of one-space copy chases away some huge percentage of readers? I root for two-spaces because anything that lets a bit more "air" into your text, making it less of a solid wall of gray type, has to be good. A far more effective way to do that is to use short paragraphs. Either way, I'm too old to change. I can't not hit that space bar twice after a period. It's as automatic as breathing. I've actually tried. Can't do it. If some proofreader with time on their hands wants to take the extra spaces out of something I've written, go ahead. I have other things to worry about. So God bless the researchers. This time, anyway. I'm ready to work with you on things far more consequential for your fundraising than how many spaces sit between sentences. I'm available for free 25-minute coaching sessions. Just click here and directly schedule an online conversation with me or with Sean Triner. I have some news for nonprofit executive directors (or anyone else who signs fundraising messages) that you may take as very good ... or very bad. Your "voice" does almost nothing to help your fundraising. In fact, your "voice" -- if you insist on close fidelity to it -- is probably costing your organization a lot of lost fundraising revenue. If you're scratching your head and wondering what I'm talking about and why, that's okay. Most EDs -- like most people -- are not much concerned about or aware of their "voice." Voice is something writers are very aware of. It's that combination of word-choice, rhythm, and cadence that identifies the personality of a writer on the page as clearly as the sound of their voice does in person. He was one of those guys that think they're being a pansy if they don't break around forty of your fingers when they shake hands with you. God, I hate that stuff. And that brings me back to fundraising and voice. When someone insists on tight fidelity to their voice in fundraising messages, they are most likely choosing less response. One obsessive goal; no bunny trails. "You" focus all the time. This probably conflicts with 90% of all writers' voices in some way or another. It's extremely at odds with my writer's voice. But if you want to move the greatest number of people to donate, you'd better choose the conventions of fundraising, even if it messes with your voice. I'm not saying fundraising itself has one monolithic voice that makes it all the same no matter who's writing. Fundraising has more of a set of principles for clarity and focus than a required voice of its own. There's plenty of room for individual voice within good fundraising. The chairman of a university physics department should probably sound different from a street evangelist. But if either the physics prof or the street preacher is a writer and highly attuned to their own voice -- they'll notice in two seconds flat that the rigors of fundraising are messing with their voice. The great ones -- the ones who believe in their cause and are more interested in getting the job done well than massaging their ego -- they let it go. When you're writing fundraising -- or more likely signing fundraising written by someone else -- your job is to raise funds. Not display your voice. 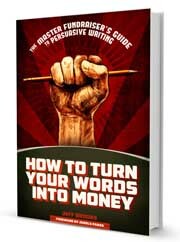 And if you're writing on behalf of someone else who has a distinct voice, your first job is to raise funds. Allegiance to that voice is secondary. Fundraising exists to raise funds. Want some practical and straightforward help with your own fundraising challenges? I'm available for free 25-minute coaching sessions. Just click here and directly schedule an online conversation with me or with Sean Triner.